Any good movie in this realm does two things within the first 10-20 minutes: 1) Shows you why you should care about the main characters, and 2) Shows you why you should be concerned for their welfare. This film nails both those things right off the bat. Following his incredibly well crafted and poignant feature film debut ‘Get Out’ (2017), Peele has released what some say is the greatest horror film of all time. Quite the sensational claim but does Peele’s ‘Us’ live up to the words? No. I’m not a horror aficionado but I can think of several films more deserving of such superlative words. That isn’t to say that ‘Us’ isn’t amazing. It’s a fantastically well-crafted film that, while it falls short of ‘Get Out’ in some respects, it outshines it in others, especially regarding Peele as a director. This is an incredible sophomore effort by writer/director Jordan Peele and if his next film is in the same space as these first two in terms of quality, I think he’ll be in the conversation for G.OA.T director in the horror space. The film’s prologue does a remarkable job of setting up the kind of tension you’ll feel throughout the film. From recurring references to biblical text to the use of reflection and even the sound design of the film, ‘Us’ lets you know right straightaway that tension is the name of the game. Like any good horror film, humor can be, and should be, found throughout. If I had to really pick something I didn’t like about the film it was there was a bit too much humor in places that I felt it took away from the gravity of the situation. Most of the time those scenes revolved around the character of Gabe (Winston Duke), the father and husband of the Wilson family; the Wilsons being the center of the story. Apart from that, there isn’t much to pick at from an objective standpoint. The family takes a summer trip to their beach home and it’s on the trip and in the house that we get to know the characters. Gabe, Adelaide (Lupita Nyong'o) and their children Jason (Evan Alex) and Zora (Shahadi Wright Joseph) appear to be a normal black family dealing with standard family dynamics: An overbearing father, an exhausted mother, a teenage (ugh) daughter and an even younger son with an active imagination. 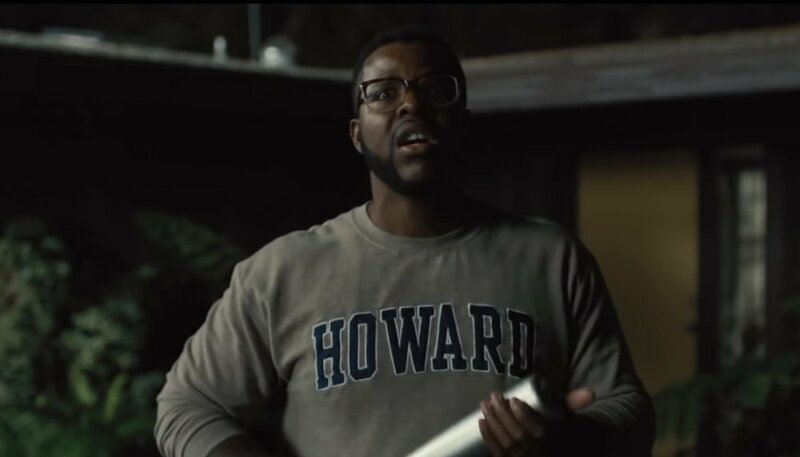 Winston Duke as Gabe seems right at home as the corny yet adorable father trying to keep the family in high spirits for a vacation nobody seems particularly desperate to be on. Zora, the teenage daughter, shows just enough angst to let you know around how old she is without being annoying as is usually seen with characters like her. Jason, the younger child, is fond of masks and magic and seems to be a little “different”. Is he more sensitive to events as they unfold? The movie never really quite shows us, but it’s clear there’s something there. Everyone here shines in their roles (both of them), with Winston Duke’s Gabe providing an incredible juxtaposition to his doppelgänger Abraham. I could be wrong but he may have gained or lost weight to play one or the other, just to provide a little extra something to each character. It could all be movie magic, but it was certainly impressive either way. The real standout was Lupita Nyong’o. Her portrayals of both Adelaide and Red were absolutely wondrous. She carried this movie on her shoulders with ease. From facial expressions to body language and vocal manipulation, Lupita absolutely devoured these roles. There are other characters/actors that have their place in the story and while I could say much about what goes on there, I’d rather not spoil anything for anyone. For months after ‘Get Out’ was released there were “hot takes” everywhere from Twitter and Reddit to the mainstream media. Everyone had an opinion about the “deeper meaning” behind Peele’s debut film and in all honestly, aside from the ubiquity of it all, it was fine. It got people talking about things that need to get spoken about. This film is different. There may be a lot of takes about the potential hidden meanings behind things, but it’ll be far more difficult to pin things down this time around. That may mean we’ll see a lot of nonsense, more so than with ‘Get Out’. That said, one thing we can all glean from this movie is that sometimes we’re our own worst enemy. The things we keep bubbling just below the surface are bound to catch up with us someway, somehow. Imaginative, fun, thrilling, and a little weird. Jordan Peele’s latest is as much fun to talk about as it is to watch. An evolution in the directing abilities of Jordan Peele. Fantastic story-telling and use of music to achieve tension. Maybe a bit too much humor in spots where it detracts. Lupita Nyong’o steals the show with her stellar performance in dual roles.